WARDJet Inc., offers two recycling systems, the WARD 1 for large users and the new WARD 2 for smaller waterjet companies not previously able to utilize or justify the larger WARD unit. The WARD 2 is simple and convenient and sells for a fraction of the cost of the larger model. Plug the WARD 2 into a 110v outlet, connect an air and water hose and removal and recycling starts. The WARD 2 is 42 x 42 inches and can be mounted with wheels to be moved easily around on a shop floor for use with multiple waterjets, even at different geographic locations. Another feature is the option to produce two different grades of recycled abrasive at the same time allowing the owner to recover a much greater percentage of abrasive. With sales approaching 100 of the proven and tested WARD 1 and newly launched compact WARD 2 units and one to two systems shipped and installed per week, WARDJet, Inc. based in Kent, Ohio, has started manufacture of the units in Europe to meet the rapid increase in demand for the WARD systems in Europe and the UK. 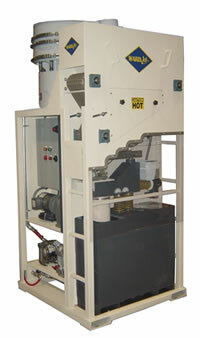 “We have been able to use the best of both sides of the Atlantic in maintaining excellent pricing of the WARD units in Europe by supplying several components from the USA, while sourcing others in Europe,” says Richard Ward, CEO of WARDJet, Inc.
WARD units have been sold in the USA now for over four years, leading recycling technology worldwide, with customers such as Lockheed Martin (WARD 1), General Motors (WARD 1), ABB (a WARD 1 and a WARD 2), Castle Metals (four WARD 1 units), Raytheon Aircraft (WARD 2), C & D Aerospace (WARD 1), the United States Army and Navy (WARD 1 units) and scores of smaller companies throughout the United States and Canada. WARDJet started selling into Europe in 1999, using airfreight to deliver the WARD units. However, as demand has soared along with WARDJet’s reputation of producing and supplying systems that are easy to use and reliable while producing an excellent recycled abrasive, the need became clear that production of the WARD units needed to be local to Europe for European sales. WARDJet chose the town of Rotkreutz, just outside Lucerne, Switzerland to be its production base for Europe. “We wanted to have a location that was central to Europe in an industrial area where we could outsource some of the components such as the frame, “ says Ward. The factory is only thirty minutes from Zurich, which is easy to fly into from anywhere in Europe and other areas of the world. WARDJet also has a WARD 1 in operation at a job shop in Zurich about ten minutes from the airport, making it easy to see a system in operation for prospective clients. With sales expected to exceed 150 units worldwide for 2003 alone, it does seem that waterjet operators are at last taking the time to notice that the savings generated from recycling are so great that, without recycling, they could be putting their very future of their companies at risk. “Recycling has allowed WARD owners to increase their profit margin more than any single contract ever could, with some WARD owners quoting recovery rates over 80%, and many 75%. These savings in turn have allowed companies to expand further or reduce their rates in the face of competition, or simply to make more money,” says Ward. The bottom line is that Gale Orem is probably right in saying, “This is the closest I have come to printing money”. As a WARD 2 owner he predicts that he will be able to maintain his present waterjet production rate and not purchase any new abrasive for eighteen months by simply recycling the waste sludge he has stored for two years. For more information, visit www.wardjet.com; email to: sales@wardjet.com, call 330-677-9100 or fax 330-677-9121. Compiled from e-mails and interview with Richard Ward, President of WARDJet, Inc.